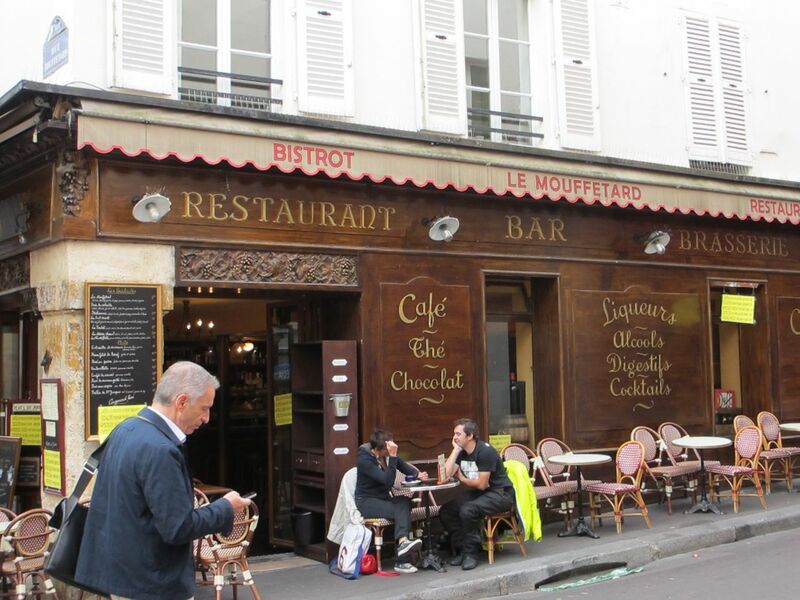 It was just after we joined the Rue des Fossés St Jacques on a cool August evening that we found, painted on the footpath, the words: ‘Au Panthéon; Simone de Beauvoir et Louise Michel’. 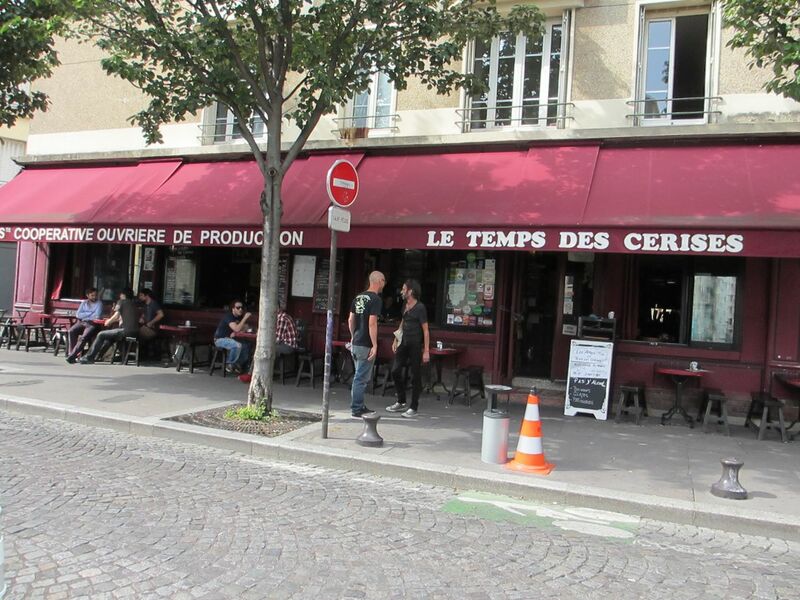 We had celebrated my birthday in a Greek restaurant just off the Place St Médard, at the southern edge of the 5ème arrondissement. After eating we had climbed the rue Mouffetard towards the Place de la Contrescarpe and the Panthéon, the final resting place of the great men of France. Of the 71 worthy people buried there only one, Marie Curie, was a woman. I could understand the case for de Beauvoir joining her; but Louise Michel was new to me. 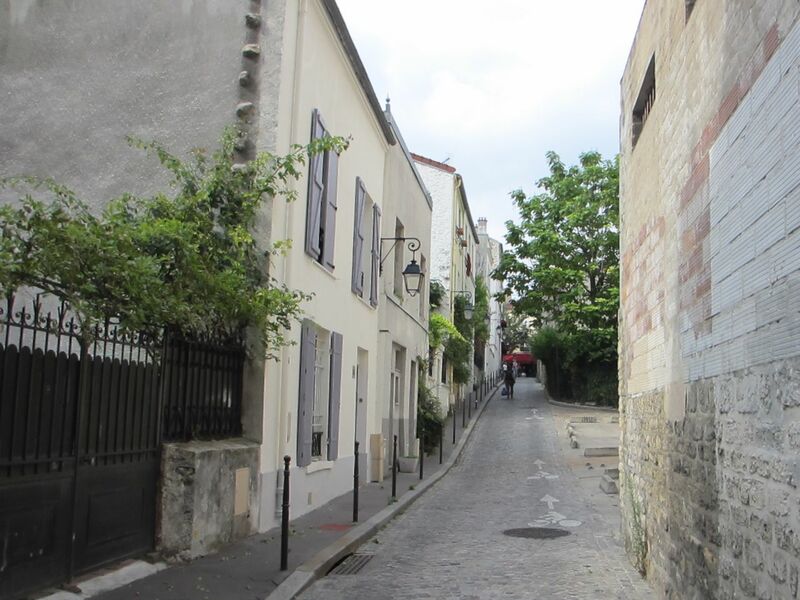 I prefer the less ordered older quarters of Paris that escaped Haussemann’s attentions, mainly those clustered around the hills or ‘buttes’ of the city, including Montmartre. 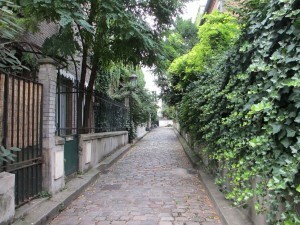 My favourite is that which tumbles down the contrescarpe along the rue Mouffetard. As we walked back down the slope I determined to find out more about Louise Michel. By the time we set out again the following morning a combination of an iPad and hotel wifi had given me a short introduction to the remarkable life of this anarchist, teacher and poet. Born in 1830 in the Haute-Marne as the illegitimate daughter of the son of the local chateau and one of his servants, Michel trained as a teacher and moved to Paris where she opened a school, wrote poetry, corresponded with Victor Hugo and became active in left-wing republican politics. 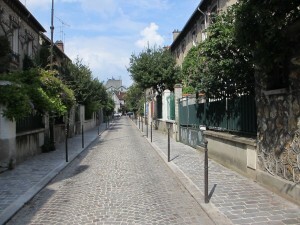 We walked along the rue Pascal, following the course of the river Bièvre which used to flow past the Gobelins and the tanneries at the foot of the Rue Mouffetard but is now confined to an underground canal. 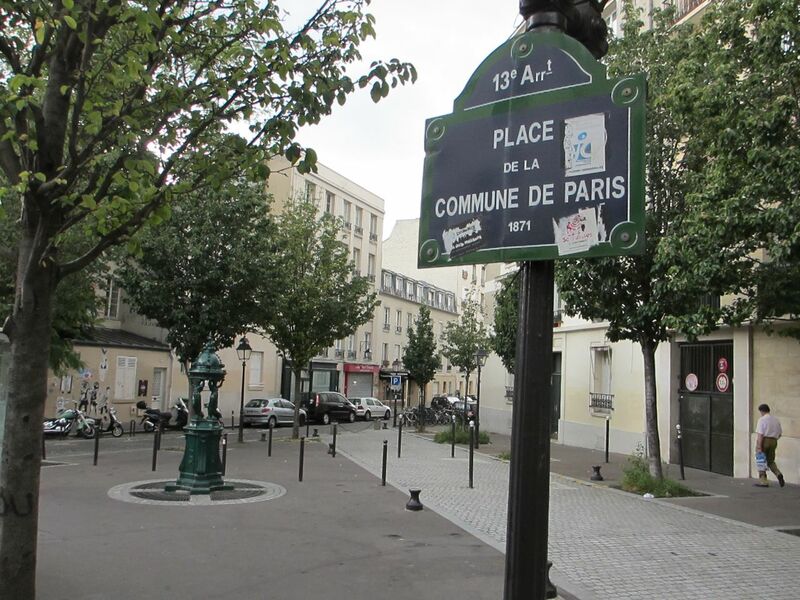 We were heading in the direction of the Butte aux Cailles in the 13ème arrondissement – in 1871 one of the last strongholds of the Paris Commune. 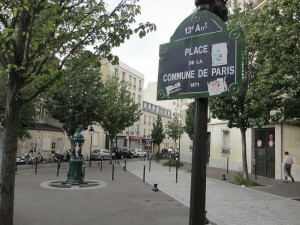 The Commune was established in Paris (and in many other major French cities) following France’s defeat at the end of the war against Prussia. The spark that lit the uprising was the French army’s attempt to take back the cannons that had been used to defend the city during the siege of the final months of the war. 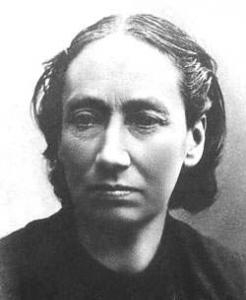 And it was Louise Michel who had alerted the people of Montmartre to the presence in the city of the French army. 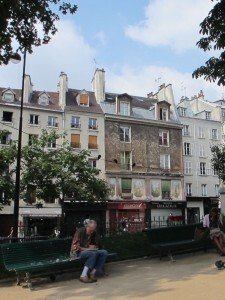 We crossed the Boulevard Auguste Blanqui – named after the revolutionary who had been imprisoned by the French government to prevent him joining the Commune – and ventured up the rue Daviel towards the Butte aux Cailles – in English the ‘hill of quails’. 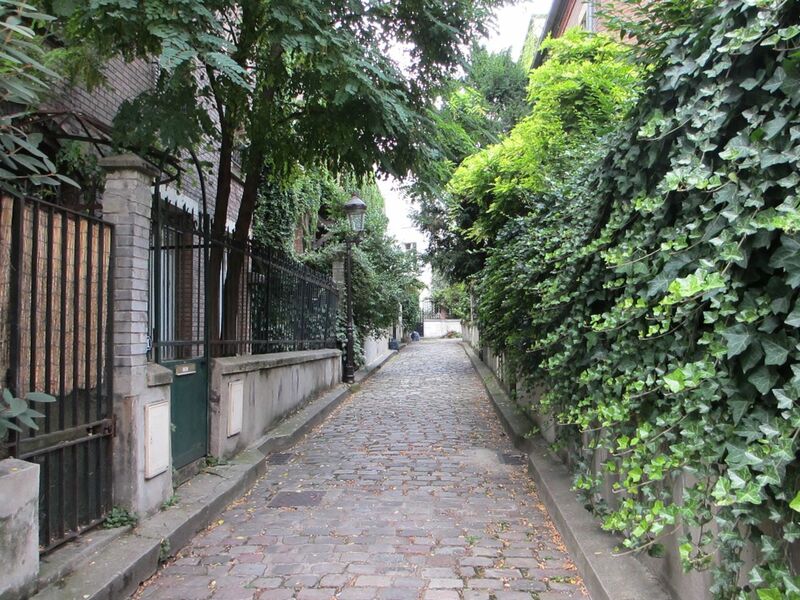 This area is another where much of the old housing has survived since before Haussmann, and numerous narrow streets and passages scramble up the hillside, lending the area a village-like feel until a more modern tower block looms up ahead and brings you back to modern Paris. Tombant sous la feuille en gouttes de sang. She was eventually freed and returned to Paris in November 1880, to be welcomed by an immense crowd. She continued her fight for social justice and remained a thorn in the side of the government, spending several stretches in prison. She wrote extensively – poems, pamphlets, an autobiography and a personal history of the Commune. When she died in 1905 some 100,000 people followed her cortège through the streets of Paris. We continued to wander around the Butte aux Cailles, lingering in particular in the passage Boitton with a Parisiénne who spends her spare time exploring and photographing the backstreets of her beloved city. She told us where we could find the graffiti below. We walked back along the Avenue des Gobelins and that evening ate in Les Bugnes, a Basque restaurant just off the rue Mouffetard. 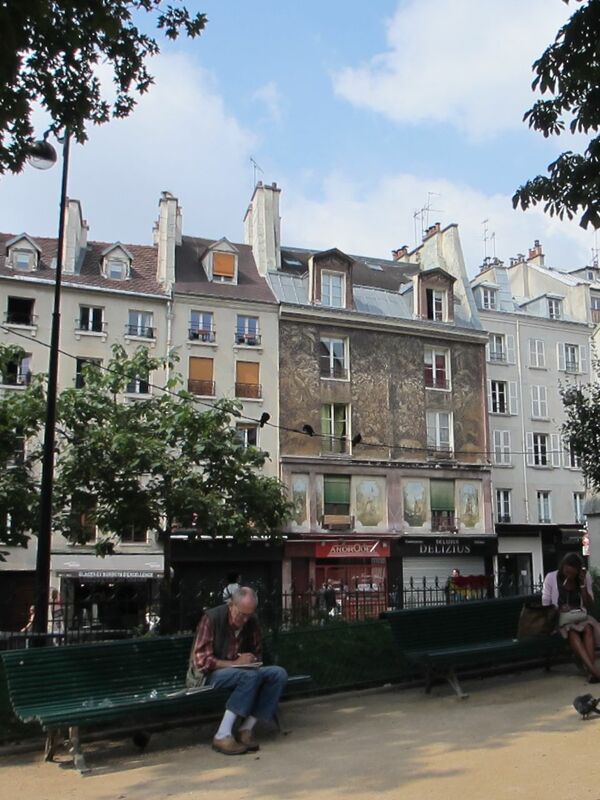 And here is the video of my song, Rue Mouffetard, with some echoes of the Commune. For more about Louise Michel you can listen to one of the BBC’s Great Lives radio programmes, read a blog from Pam McAllister or listen to a talk from Paul Foot about her and the Commune.